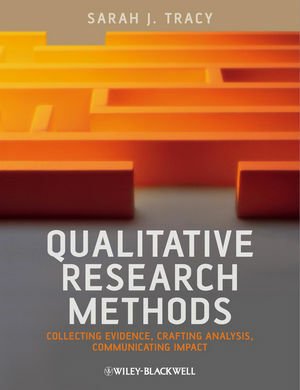 Welcome to the companion site for Qualitative Research Methods: Collecting Evidence, Crafting Analysis, Communicating Impact, by Sarah J. Tracy. Qualitative Research Methods is a comprehensive, all-inclusive resource for the theoretical underpinnings and practical conduct of qualitative methodology. Along with providing clear and concise guidance on how to design and theoretically ground research studies, write up proposals, and navigate institutional review boards, qualitative methodology expert Sarah J. Tracy also offers invaluable tips for recruiting participants, practicing fieldwork, and conducting interviews and focus groups. Web materials created by Jennifer Scarduzio, Elizabeth K. Eger and Sarah J. Tracy (unless otherwise noted). Elizabeth K. Eger, M.A., is a doctoral student at the University of Colorado at Boulder specializing in critical, qualitative, and engaged organizational communication research around issues of difference, power, and identity. Jennifer Scarduzio (Ph.D., Arizona State University) is an assistant professor at Lamar University. She conducts qualitative research in the areas of organizational and health communication centering on emotion, wellness, and identity.